Home / News & Blog / Welcome, Rosie and Nadia! 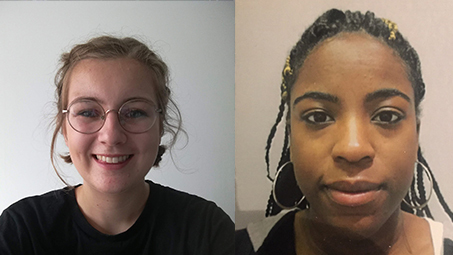 We welcome Rosie Sewell and Nadia Daniel, our new Programme and Marketing Interns! They will be part of the TS team for the next six months, honing their skills and developing new ones, experiencing life in the busy Marketing Office. I’m a first year Music student at the University of Southampton, and am a classical singer, but I also play cello, recorder and am slowly learning violin. I am really excited about working at Turner Sims for the next few months, and hope that I can help bring music to the public through my role as Programme and Marketing intern. I want to get students and the general public involved with concerts and outreach programmes run by Turner Sims, and also am really interested in writing previews and reviews, doing interviews, and getting immersed in all styles of music while I’m here! Today I’ve begun my journey as an intern at Turner Sims in the programme and marketing position. Located in Southampton, this organisation has been recognised as one of the most superb concert venues in the country and is host to a wide range of talented and renowned jazz and classical artists, both nationally and internationally. As an intern, by the end of the programme I would like to have built upon my marketing skills and have learned how to best attract audiences in order to increase revenue for Turner Sims, as much as is humanly possible!